The most important issue for us while living on the hook is to conserve water. We’ve learned to be extremely frugal when it comes to water usage. We rarely, if ever take a “real” shower. We wash dishes in salt water and then rinse them in fresh, using a pump-up spray bottle. Every day is an exercise in using as little water as possible. 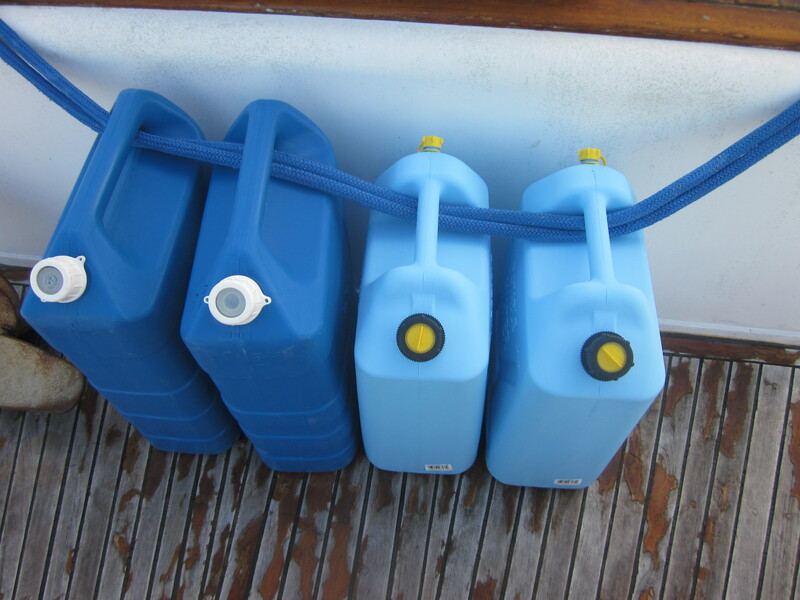 Taking on water to refill our tanks means loading jerry jugs in the dinghy and filling them at a dock someplace. We then haul them back and dump them in our tanks. This can mean many trips back and forth until all our tanks are full, including the jugs themselves. It might be a full days work. 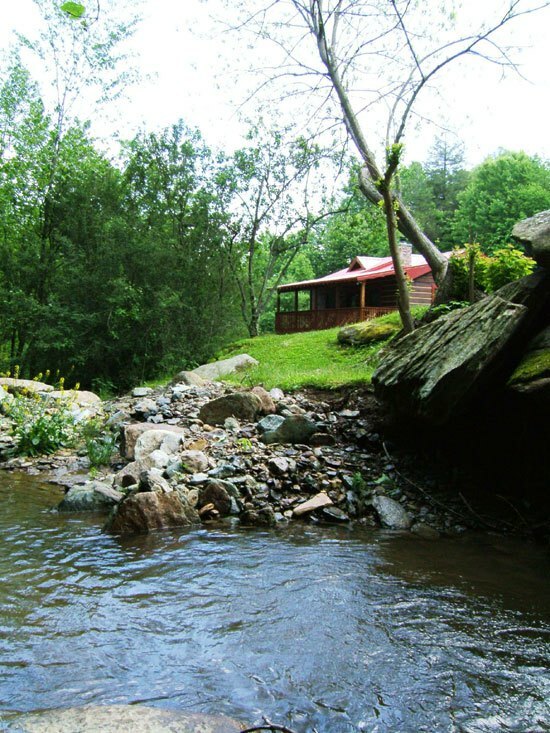 When we purchased Leap of Faith, it came with two below deck, poly water tanks. They are small for a trawler. Each holds only 30 gallons. We soon learned that 60 gallons didn’t last very long. Being super stingy meant a daily water usage of three gallons per day, which lasted us about three weeks, with 20 gallons in reserve in the jugs. We wanted to stay out longer than that so we improvised. over time we’ve acquired more than double the water holding capacity through the use of additional tankage and jugs. One of the things we are blessed with in our trawler is lots of space. We’ve got plenty of room and storage capacity. Our first big addition to take advantage of all that space was a 65 gallon poly storage tank which I installed on the flybridge. That effectively doubled our capacity. We attach a hose to it and run it down to the lower deck for freshwater showers. It sits in the sun all day and it’s nice and warm when we return from the beach. The hose has a shutoff valve and a sprinkler nozzle. 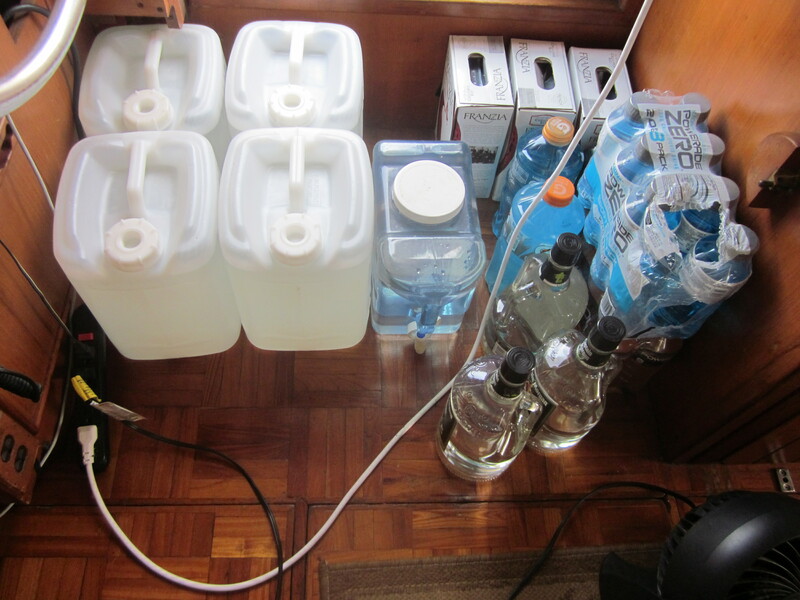 Up on the bow are our jerry jugs, two six gallon and two five-gallon, for twenty-two more gallons of water. Four jugs at three-gallons each and a little two-gallon container. That’s fourteen more gallons. We use this water to make ice and coffee mostly. Sometimes I mix up some powdered Gatorade with it. If we run out, there’s always the rum! 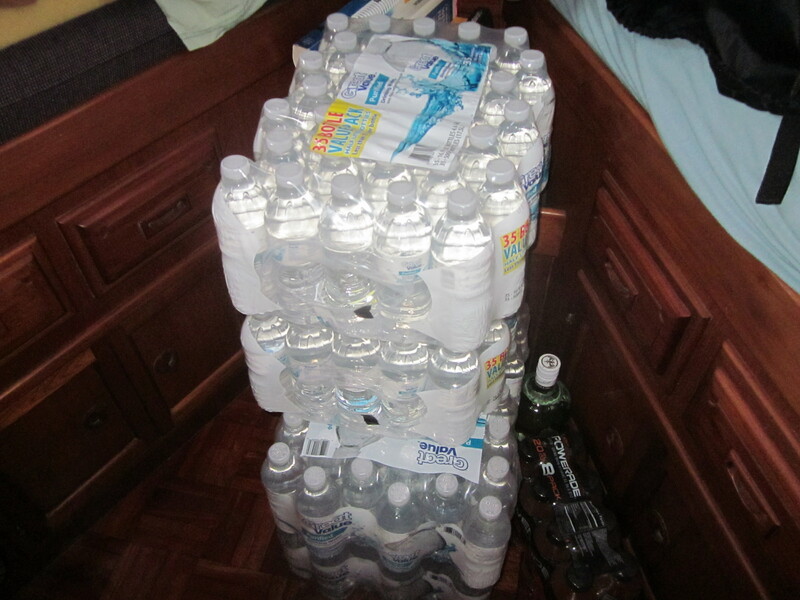 In addition to all that water kept in tanks and jugs, when we can we totally stock up on bottled water. We’ve got several cases stored under the settee, and several more in the Vee Berth. Right now we have ten cases on board. We drink it, make ice and coffee with it when the small jugs run out. It really is a luxury to have so much space. Water conservation is still a constant concern, but now we can go two months before we need to start worrying about refilling. Of course, anytime we get somewhere that water is available, we top off everything while the getting is good. 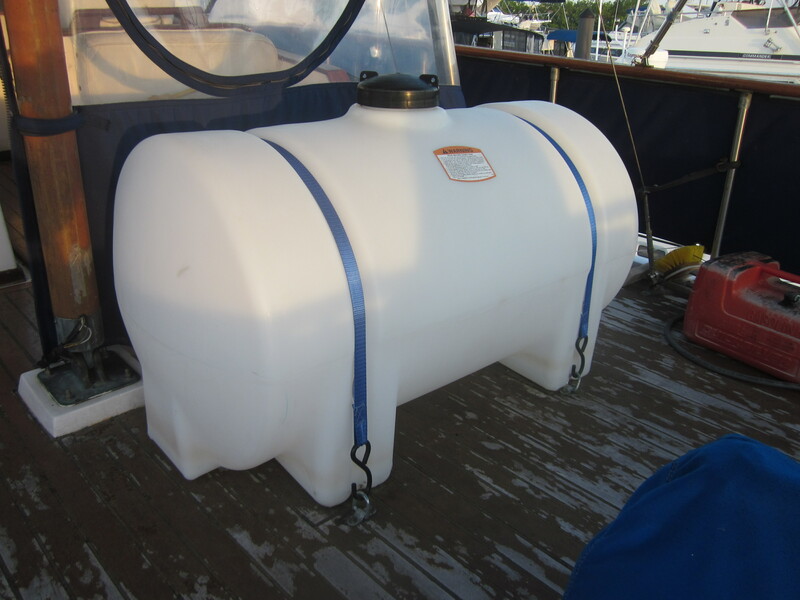 I realize all of my sailboat friends don’t have the kind of space necessary to store all these extra jugs, tanks and cases, but what creative ways have you found to increase your water capacity? This entry was posted in Uncategorized and tagged Boating, Ed Robinson, Life on a Boat, Live on a Boat, Liveaboard, Liveaboard Boating, Sailing, Water tanks on a boat on July 1, 2014 by Ed Robinson. Cost mainly, and the water here isn’t good enough to use one. The Bahamas is a different story. The tank is well centered and as you said, it’s like having three extra adults aboard. If I get caught in horrible seas I can always dump it if it becomes a problem. Have you considered any reverse osmosis/watermakers for Leap of Faith? That would be great in the Bahamas, though expensive to install. Here around Charlotte Harbor the water isn’t good enough to use it. I certainly understand the water issue. Our 32′ Catfisher held 120 gallons of water and that would last us about two weeks. We weren’t much into conserving water when we lived aboard. Have you put any thoughts into a system to catch rain water. A friend of ours installed a system on top of his hard bimini that could direct rain water straight into his fresh water tanks. I imagine he had to clean the bird poop off of it on a regular basis but that sounds easier than loading up water in 5 gallon jugs. We have collect rainwater occassionally, but yea, things have to be clean. Most of the time we can’t spare any fresh water to clean the topdecks. If it rains a ton, real hard, we’ll then start collecting if it keeps raining.